Me and D: Thank You, Waitress!!! 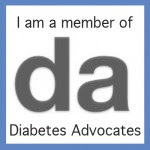 So I was planning on taking the whole week off, especially since I'm participating in Diabetes Blog Week next week (and you can too). Last weekend, my husband and I went out to lunch with my mom. We were finishing our food, and I asked for a refill of my Diet Coke (shocking, right?). So she brings me another soda, and we're all chatting away. I'm talking so much I haven't even taken a drink of my soda yet (shocking, once again) when she comes back. "Ma'am, you had a Diet Coke, right?" "Well, I think I brought you a regular Coke by accident. Let me go get you a new one." OMG! Seriously? I wanted to jump up and hug this woman! In hindsight, that's exactly what I should have done, but oh well. When she came back, I did explain that I was Type 1 diabetic, and that she had likely saved me from some serious high blood sugar. She just smiled and said "you're welcome." Usually I can tell the difference between regular and Diet Coke, but what if I wasn't paying attention and had accidentally drank the regular Coke? We all know how that ones goes, right? I was so impressed and shocked at her wonderfulness that stupid me didn't even think to ask to talk to the manager so I could share her awesomeness. Facepalm. And of course, her name's not on the receipt. So this weekend, I'm going to go back to the restaurant and talk to the manager. Hopefully I can describe her well enough so they can figure out who she is. And if she's there, I'm going to go give her a big hug! What an awesome waitress!! Hope she got a huge tip.... All waitstaff should be that way. OMG! That's amazing! I've had the opposite happen more often than not. . they bring the wrong thing and then argue with you when you question it. I'd like to know which restaurant that was, I'll not only go, I'll make it a regular haunt! I love people like that. Seriously, with all idiots we encounter these are so rare!